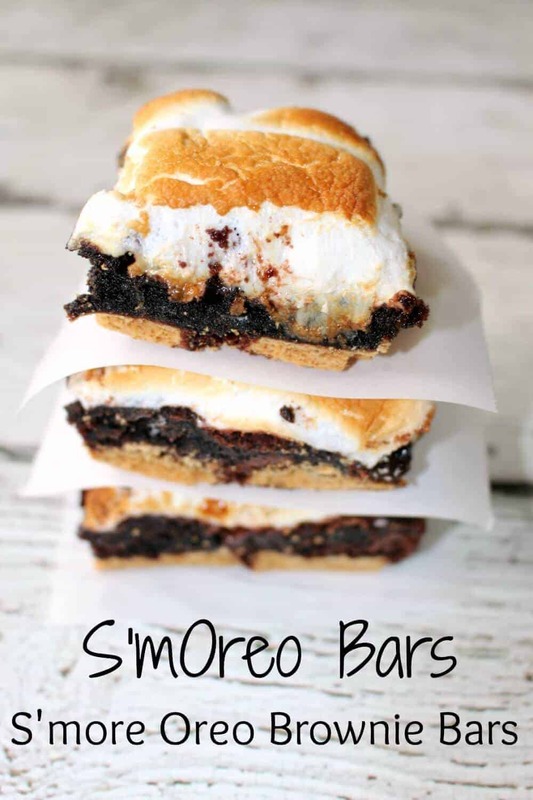 What happens when you take Oreo’s, brownies and s’mores and mix them together? 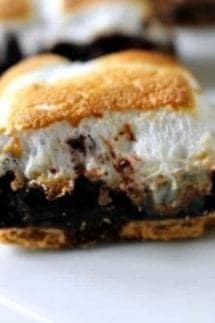 You get the most delightful dessert ever, S’mores Oreo Brownies! Then cut them into cute little bars and they become S’mOreo Brownie Bars. Three of my favorite desserts combine into one! S’mores Oreo Brownie Bars otherwise known in my house as the S’mOreo, has become a summertime favorite in my house. I’m not sure exactly what it is about s’mores that I love so much. It could be the warm and gooey marshmallows or possibly the melted chocolate. Honestly though, I think it is just that it reminds me so much of warm summer nights out in our backyard just hanging out with our neighbors. What I adore about these S’moreo brownie bars, is that they can be enjoyed all year round…no campfire needed. I can get that taste of summer in the dead of winter! Use the remaining brownie batter to cover the marshmallows and along the sides of the Oreo cookies – spread it as evenly as possible. Bake for 45 minutes (this may vary depending on your oven – check around 35 minutes to see if they are done. Personally, I prefer them a little overcooked than undercooked). Take out of oven and place a layer of marshmallow on top of the brownies (again, I cut my in half). Place them under the broiler until they start to get golden brown – NOTE: Do not take your eyes off of them, they burn really, really fast. The longest you will need to leave them is 2 minutes. Let them cool completely before cutting – otherwise you will have a huge mess on your hands! I left mine for about 2 hours before I cut them! What happens when you take Oreo's, brownies and s'mores and mix them together? You get the most delightful dessert ever, S'mores Oreo Brownies! Then cut them into cute little bars and they become S'mOreo Brownie Bars. Three of my favorite desserts combine into one! Use the remaining brownie batter to cover the marshmallows and along the sides of the Oreo cookies - spread it as evenly as possible. Bake for 45 minutes (this may vary depending on your oven - check around 35 minutes to see if they are done. Personally, I prefer them a little overcooked than undercooked). Take out of oven and place a layer of marshmallow on top of the brownies (again, I cut my in half). Place them under the broiler until they start to get golden brown - NOTE: Do not take your eyes off of them, they burn really, really fast. The longest you will need to leave them is 2 minutes. 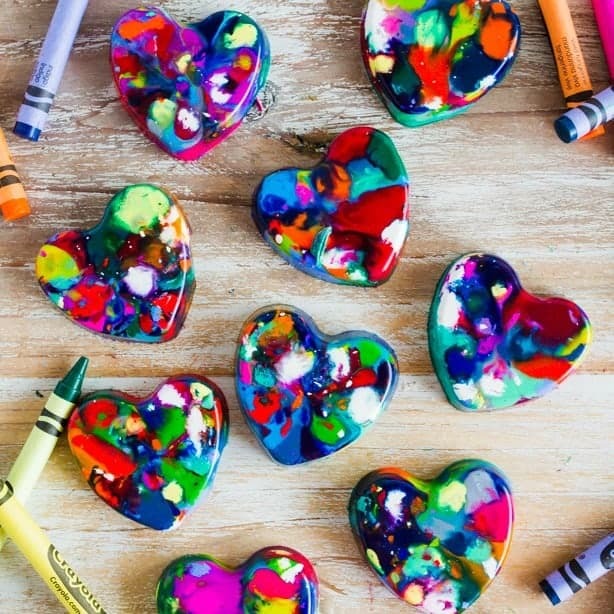 Let them cool completely before cutting - otherwise you will have a huge mess on your hands! I left mine for about 2 hours before I cut them! 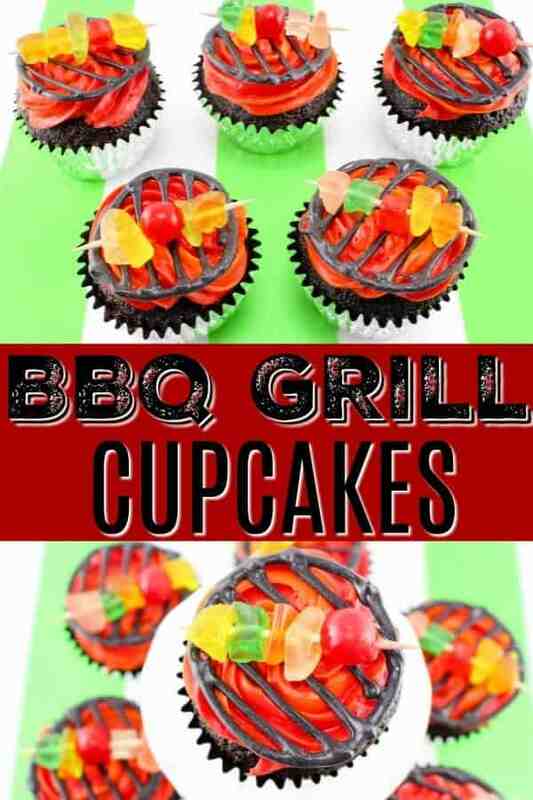 BBQ Grill Cupcake – Celebrate summer (or anytime of the year) with these adorable Grill Cupcakes! Perfect for Memorial Day, Father’s Day, Fourth of July, Labor Day or just SUMMER!! 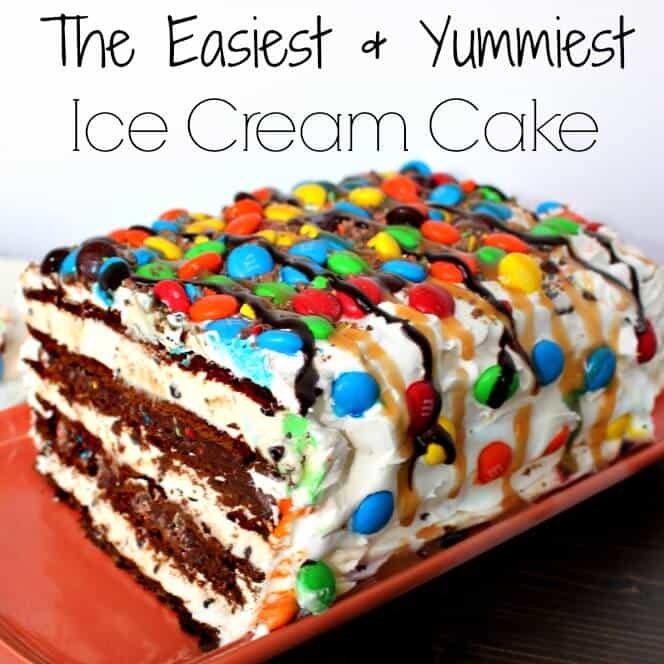 Ice Cream Sandwich Cake – This Ice Cream Sandwich Cake is an easy to assemble, no bake dessert will quickly become an all time family favorite! 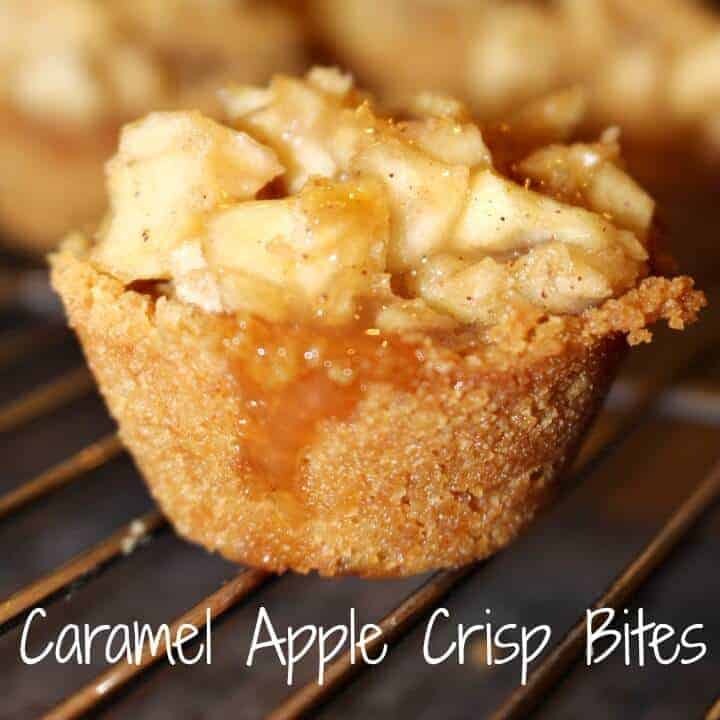 Caramel Apple Crisp Bites – Caramel Apple Crisp Bites bring all of the flavors of fall into one delicious dessert. The apple cinnamon filling and the graham cracker crust will warm your heart and fill your tummy. Jenna – I want to bottle you up and bring you home! I love finding someone as enthusiastic about a dessert as me! I have been running around all week saying “OMG S’mOreos OMG!!!! The picture shows the marshmallows on top but recipe has a brownie layer on top. Which is correct? 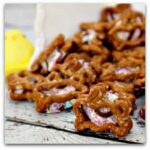 Hi Candy – You bake the layers with the final layer being the brownies – when those are done, you take them out of the oven and put an additional marshmallow layer on top and broil that for about 1-2 minutes (until golden brown). Hope that makes more sense! These were horrible, we double and triple check the recipe, and the brownie once too. The marshmallows were burnt so bad you couldn’t even eat the top, the brownie battery didn’t even finish cooking. So I don’t know where you got that picture, or you write down the direction incorrectly. So disappointed. I just made these last night. How did you store them? I made them in advance for a party this weekend. Can I just cover and leave out? I’m afraid if I refrigerate or freeze the graham cracker will get mushy or the marshmallows won’t be the same. I made this twice. Followed the recipe to a ‘T’. Both times it was hard as a rock. Especially around the edges. Any suggestions? That is so weird!!! Maybe try cooking for less time?? 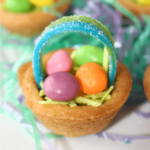 These did not come out well at all. I’m a seasoned baker and these were burnt on top (not talking about the marshmallows, i added them last) and not done in the middle. Its too thick. I followed directions and my oven is fine. I usually don’t leave reviews but I wish I would’ve read the others before I made this. So sorry they didn’t come out for you! Not sure what happened. What type of pan did you use? 9×13 glass?? 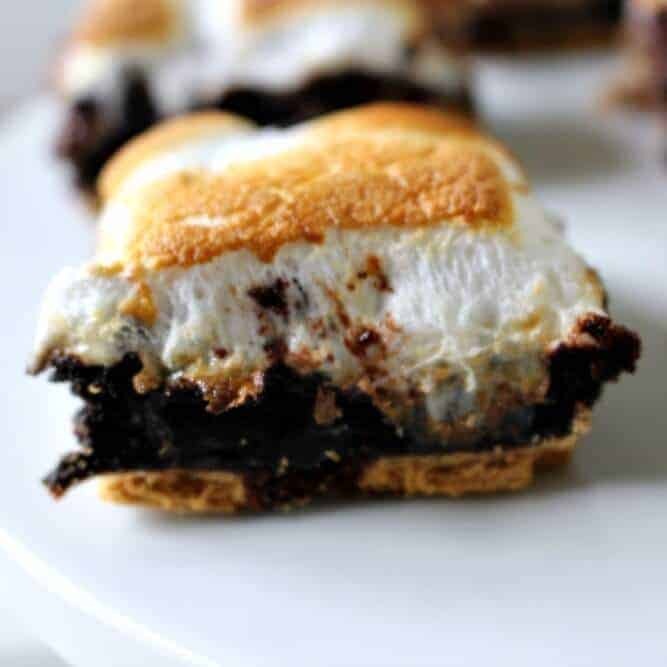 Hi, I’m going to try to make these for a party this weekend(my niece requested me to make something to do with s’mores for desert) but I was wondering have you ever tried or what do you think about putting graham cracker crumbs on top of marshmallows before you put them under broiler? Thanks! I have not tried that!! Let me know how it comes out – can’t be bad, right? How do you know when they’re done baking? Will a toothpick actually come out clean like with regular brownies? Unfortunately, not really. Because the Oreo’s get melty and never really “cook firmly”. Mine were around the same time as it stated on the box of brownie mix. I would err on the side of overcooking a bit, but that is just me! I’ve made these several times and they’ve come out perfectly. They’re a gooey mess-just how brownies should be! To eliminate the added sweetness from the cream filling in the Oreo’s, could I substitute with chocolate “wafers”? If so, I’d probably have to double up the wafers to equal the Oreo’s? I like sweets, I always want the key ingredient (chocolate, strawberry, lemon, banana, etc) to stand out. I want to make this recipes for the coming weekend… I have a question…so do I just back the ingredients first minus the marshmellows? 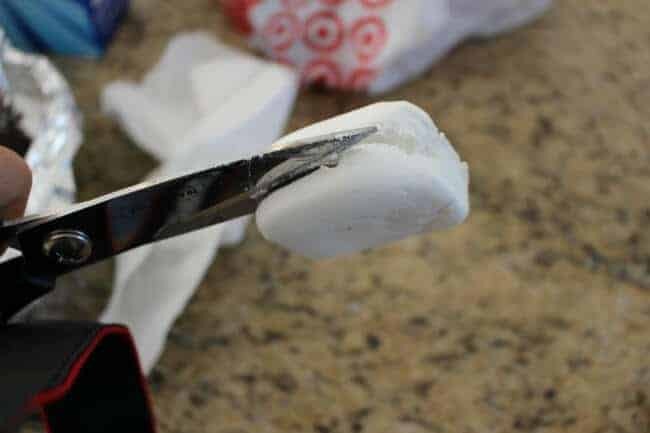 Or…put one layer of marshmellows let it bake for asking time take it out and then put another layer of marshmellows for 2 mins? Looks delicious. Even after reading the comments and rereading the directions, I am left confused. The step by step worded directions do not match the step by step photos of the recipe. My question is about the layering of ingredients and baking order.